Outside funding will reduce a student's work study component before affecting the QuestBridge Scholarship. Outside funding which exceed $2,000 will replace the student's work-study award and any amount in excess of $2,000 will reduce the QuestBridge Scholarship on a dollar for dollar basis. Outside funding may not be deferred to subsequent years. 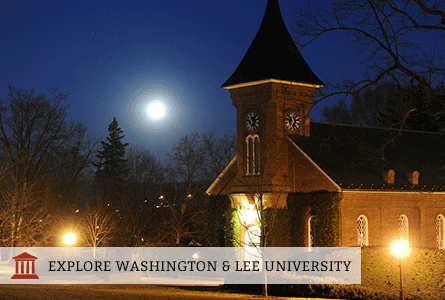 Washington and Lee requires all students to have health insurance. If a student is not covered by an insurance plan, the QuestBridge Scholarship will be increased to pay for the Washington and Lee student health insurance plan. Students are allowed a specific amount for travel each year (travel allowance), which is determined by the student's home address. The travel allowance is in addition to the total costs listed above and the QuestBridge Scholarship will be increased to cover the total amount of this allowance. QuestBridge Scholarship recipients are required to maintain a 2.7 for both their cumulative and major term GPA. Students not meeting this requirement may face a reduction or loss of their award. The work-study component of $2,000 allows for 7-8 hours of work per week for first-year students. Students may choose to replace their work-study eligibility with a loan. The allowance for room and board includes a full meal plan and the cost of a double room on campus. If a student chooses to have a single room, the cost of room above the average cost of a room on campus will not be covered by the QuestBridge Scholarship, and will reduce the amount of money the student has left for books and personal expenses, and/or may require the student to contribute towards the cost of the room. The award letter is not official unless it comes from Washington and Lee; the QuestBridge "award letter" does not represent a commitment from the college. Washington & Lee awards a significant amount of merit-based scholarships through the Johnson Scholarship Program. Any QuestBridge Finalist who matches with Washington and Lee, or any non-match QuestBridge Finalist who applies to Washington and Lee either Early Decision or Regular Decision with the QuestBridge application will automatically be considered for the Johnson Scholarship without an additional Johnson Scholarship application. 45% of Washington and Lee students received need-based aid during the 2018-2019 school year, and the average financial aid award was $43,654. Learn more. Use Washington and Lee 's Net Price Calculator to determine the financial aid for which you are eligible.